TopTech TMT Bars are manufactured after the incoming scraps are analyzed for chemical composition and are segregated for unwanted material like Cast Iron, non-metallic, non-ferrous, etc. The billets are tested to maintain the certified composition of Carbon, Sulphur & Phosphorus much lower than the specification. 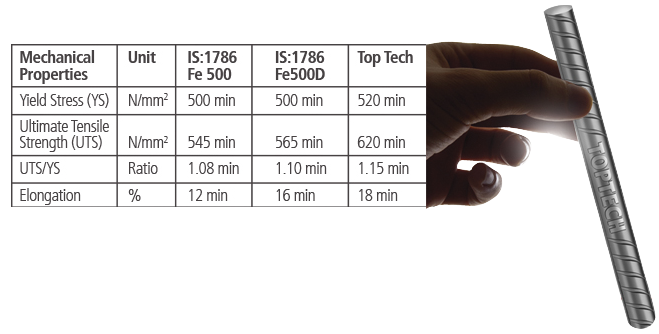 This results in more longevity, excellent ductility, higher bendability, better corrosion resistance and superior weldability and enhances its intrinsic quality to withstand load under adverse conditions.